Marvelously manipulative, pushing all the right buttons, resulting in an ultimately satisfying movie experience; Sam Rockwell and Taraji P. Henson, seasoned stars, paired perfectly as C.P. Ellis, President of the KKK in Durham, North Carolina and Ann Atwater, a fiery African American civil rights activist; it is 1971 and school integration percolates heatedly in the divisive, racist white community in tandem with the disenfranchised, disgruntled African Americans; to smother the conflagration, negotiator Bill Riddick (with excellent equanimity, Babou Ceesay) stages a “charrette” between the opposing factions; C. P. Ellis and Ann Atwater co-chair the summit; over a two week period, in the closest of quarters, lives are irrevocably revamped, prejudices transformed, exacerbated differences shrink through debate, compromise, comprehension. Writer/director Robin Bissell, with a huge dose of poetic license, tells the tale of two massively disparate individuals, who against all odds, become friends. 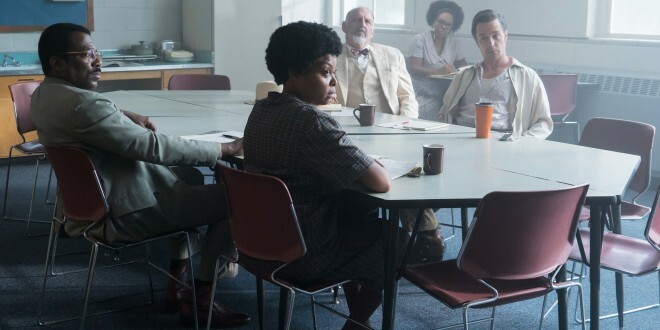 Taraji P. Henson and Sam Rockwell, with impeccable skill, bring life, decency, potency to their interpretations of C.P. and Ann; underneath layers of bigotry, there’s a level of goodness hibernating at C.P.’s core and Ann has the prescience and grace to excavate it; Bissell introduces audiences to two rarities, and the introduction could not be more gratifying.